The much touted rule of law which the President Goodluck Jonathan promised to observe during his election campaign was disregarded yesterday when the Federal Capital Territory, Abuja, administration, led by Senator Bala Mohammed, approved the demolition of residential structures at Mpape, a suburb on the outskirts of the FCT. Residents of the community lamented the misinformation they were fed regarding the date which was tentatively put at August 31. They were however cut unawares yesterday when they got news that the government has commenced the demolition. 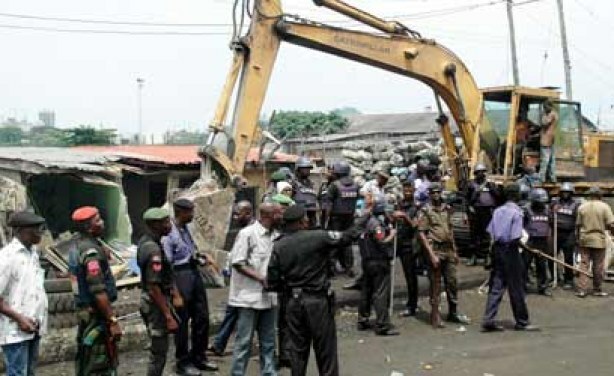 The Attorney-General of the Federation (AGF) and Minister of Justice, Mohammed Bello Adoke (SAN), through the office of the Solicitor General of the Federation and Permanent Secretary in the Justice Ministry, Abdullahi Yola, had earlier yesterday advised the FCT minister to stay action on the demolition pending the determination of a suit by the residents against it. Mr. Femi Falana (SAN) had asked AGF to intervene in the matter due to the perceived adamant position of the FCT minister, Bala Mohammed, to ignore the court order and go ahead with the demolition on. With the demolition date brought forward and executed yesterday, residents are confused as to their next line of action. Watch video clip of the Mpape demolition below.